Tomorrow is Valentine’s Day, and many of us will be eating chocolate and having romantic dinners in a fancy restaurant or at home. Since February is the heart month, it is only fitting that we offer you Baptist Health’s version of a heart healthy recipe to heighten the senses and add a touch of romance to the evening. Katty Guevara, ARNP, HFNP-C, MBA, the heart failure resource program coordinator at Doctors Hospital, works with patients to raise awareness of heart failure, especially among those who are at high risk for heart failure and stroke. Heart failure is a condition where the heart does not pump as it should in order to meet the body’s needs. How do I know if I am at high risk? Blood pressure, which can be reduced and controlled. Exercise, which can be started and/or increased. Tobacco. Reduce risk by quitting smoking. She suggests this healthy recipe from EatingWell, which will satisfy your taste buds and is healthy for your heart. “Enjoy a piece or two of dark chocolate after your meal – it’s good for your heart too, and it is Valentine’s Day,” she says. Toast pepitas. Place in a small dry skillet, and cook over medium-low heat; stir constantly until fragrant and lightly browned. Two to four minutes. Generously coat a large nonstick skillet with cooking spray and place over medium eat. Sprinkle salmon with salt and pepper; add to the pan and cook until browned and just cooked through the center. Cook two to four minutes per side. Remove the pan from the heat, and transfer the salmon to a plate. Add the butter-lime mixture to the hot pan; stir until the butter is melted. Nutritional Information: (per serving) 267 calories; 18 grams fat (6 grams saturated fat, 6 grams monounsaturated fat); 77 mg cholesterol; 2 grams carbohydrate; 0 grams added sugars; 24 grams protein; 0 grams fiber; 360 mg sodium; 458 mg potassium. Nutrition bonus: Omega-3s; Carbohydrate servings: 0; exchanges: 3 lean meat; 1 fat. 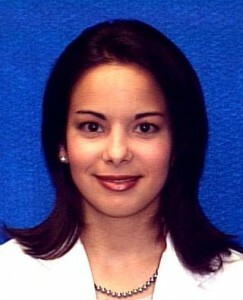 Katty Guevara graduated from Barry University with a BSN in 1998. She has worked in numerous positions throughout her career, and for the past 15 years has been at Baptist Health South Florida. Since May 2011, Ms. Guevara has worked as a nurse practitioner, counseling and monitoring patients admitted with a diagnosis of heart failure. Most recently, she has begun to work with low-risk chest pain patients and has been instrumental in educating and promoting a heart healthy lifestyle. A member of the Heart Failure Resource Program at Doctors Hospital since its inception, she and her team have been successful in bringing down 30-day readmissions for heart failure patients from 29 percent to 17.1 percent.